Twelve of the original series of fourteen paintings will be exhibited from April through September in the Museum at Lord's Cricket Grounds. 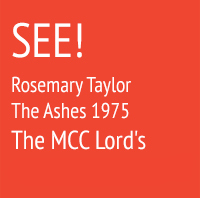 Rosemary Taylor’s Cricketer Series was painted entirely from analogue terrestrial television recordings of the Ashes series held in England in 1975. Taylor was gripped by the hype and drama surrounding the series, which Australia won 1-0 after four Tests. The dynamic movement of the fast bowlers captivated Taylor’s imagination and she set about translating the action transmitted through the television set onto the static two-dimensional canvas. In effect she was painting the quickly displaying successive scan images that created the illusion of smooth, fast motion. By playing, rewinding and pausing a recording of the match, made possible by the physics of the CRT, she was able to analyse the movement of these cricketers in detail. She began by studying static images, then moved on to slower motions and then on to faster images – the moment when the bowler released the ball at a speed of 80 mph. Her style gradually evolved in a slow progression towards movement through the series. The first two cricket paintings in the series were still fairly static. Excess is a still portrait featuring English captain batsman Tony Greig with Australian wicket keeper RodneyMarsh. The second, Australian Honey, shows Doug Walters and Tony Greig moving slowly right past Dickie Bird. Australian cricketers Dennis Lillee and Jeff Thomson were the outstanding fast bowlers of their generation and Rosemary’s later paintings dramatically illustrate their speed, creating a blurring effect to convey the movement. 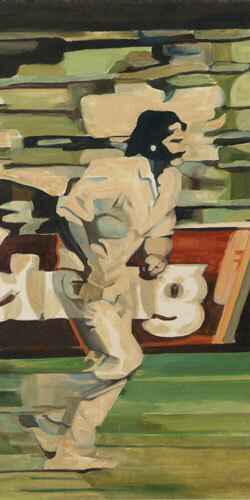 Taylors’s distinctive technique is also beautifully demonstrated in the painting Lillee and Dickie Bird. Lillee’s figure almost disintegrates with speed and power, superimposed upon the solid umpire figure of Dickie Bird, whose legs are recognisable, while his upper torso is dissolved by Lillee’s body hurtling past. ‘Somewhere beside the thunderbolt there’s the unique Dickie Bird, the calm behind the storm’ commented Thames TV news presenter Chris Kelly (1977). Seeing this painting reproduced in the Guardian, Dickie Bird wrote asking Rosemary if she had a more recognisable portrait of him! In Taylor’s Cricketer Series it is possible to see her painterly interpretation of the horizontal and vertical synchronisation patterns of elections, known as rasters, which gives the impression of movement. Her paintings capture the late 20th century television audience’s experience of cricket, an experience vastly different from what spectators in the pre-television ages and what digital TV audiences observe today.